I have a standing dinner date with a friend every Monday night, so I was thinking about having a new thing at Metblogs where we cover a different restaurant in downtown San Jose every week. We already have many favorites downtown and thought it would be a great way to let more people know about them. Unfortunately, last night did not go as expected. We chose San Jose’s beloved Gordon Biersch last night because my friend was dying for their French fries. Gordon Biersch serves delicious fries which you can order standard or garlicky. They are always delicious! When our server took our order, my friend asked for a chicken sandwich and fries, and requested extra French fries. We told her we had come specifically for the fries that night, and that my friend would rather have more fries and less sandwich, if anything. She also asked for a side salad with oil and vinegar, and I ordered my favorite dish, the Cedar Plank Pecan Crusted Salmon. The first problem arose when the salad was served with no dressing at all. A different server had brought the salad, and when we pointed out there was no dressing she quickly brought the oil and vinegar bottles over. No big deal. The second problem arose when our dinner was served and my friend received her chicken sandwich not with extra fries, but with what looked like less fries than usual. The waitress apologized and said she had requested extra fries, but that was all she was given. The third problem arose after the waitress left and I looked down at my own plate. My salmon was still sitting on the cedar plank; usually it is removed at serving, but no biggie. I took the piece of wood off the plate but then stared at my salmon… something was missing. It had a pile of pecans on top as usual but there was no dill cream sauce!! We flagged another server down and pointed it out. She again apologized and offered to have the chef put the sauce on or just bring me out some sauce on the side. Same result so I didn’t care; she brought me a little tin of sauce. Before we go to problem four, let me state that Gordon Biersch’s Cedar Plank Pecan Crusted Salmon is one of my very favorite dishes in the whole world, and I rarely order anything else at GB because I can’t stand to go to GB and NOT get it. I know the dish, I know it’s delicious (heaven, usually), and every other time I’ve ordered it has been perfection. But not this time. I put the sauce on the fish and tried to cut into it with my fork. And I mean TRIED. This piece of salmon was so overcooked and dried out it was almost inedible. I could tap my fork on top of it and it was just solid salmon crust. I would expect better salmon served at Denny’s. But I wasn’t at Denny’s, I was at Gordon Biersch and had ordered a dish that cost almost $21. If this was the first time I had ordered this dish I never would have ordered it again. Under normal circumstances I would have sent the dish back, but we are on a tight schedule for our Monday dinners so it just wasn’t an option at that point. I’m not being sarcastic when I say the sweet ginger rice was delicious, and my friend loved her chicken sandwich and fries. She was just disappointed that there were not a few more fries. And it’s not like we expected GB to serve her bottomless fries for no charge, but do potatoes really cost so much that they couldn’t throw a few extra on the plate for a happy customer? Any ONE of these problems would have been silly to complain about (well, except for the overcooked salmon). Any TWO of them could have been overlooked. But when you have FOUR issues with dinner, and one of them results in a very sad $21 meal, it’s just not right. To be fair, I can’t remember another time when we have had a bad experience at Gordon Biersch, and we chose it last night because it is one of our favorite restaurants to go to downtown. Metblogs has been chided before for putting up bad reviews of restaurants that are normally fantastic, but is it right to let this go? Gordon Biersch is not a cheap restaurant, and if we’re going to have a $50 tab we shouldn’t have to ask for each specific ingredient to be included on our plates, and no one should be served a dried up piece of $21 salmon at any time. It was my prerogative to send or not send the fish back, but it is my right as a paying customer to not have been served an obviously unacceptable piece of fish in the first place. And seriously, how much do potatoes cost? She couldn’t have been given just a couple extra? An unhappy customer is an unhappy customer, and restaurants should strive to make every customer happy, not just customers with the power of the review pen. Because every customer has access to Yelp reviews. So I stand by our right to post the honest review of our experience last night. I expected to be writing a great one this morning, but one bad dinner changed everything. Recommendation: Normally it’s priced a bit on the high side but the food is delicious and the service is always friendly and quick. The beer of course is outstanding. But based on last night’s dinner: 2 stars out of 5. Bus Rapid Transit (BRT) is a system where specially designed buses in dedicated lanes enable highly efficient public transit comparable to light rail with much lower construction and vehicle costs. VTA has completed an environmental impact report and begun preliminary engineering to build a BRT system for the Alum Rock-Santa Clara corridor (replacing the current Rapid 522 service). A future project would add BRT service between Eastridge Mall and De Anza College via Stevens Creek Blvd, supplementing the current route 23 local bus. Now they’re asking for your input on two options for the design of bus stations along this route. The designs and survey are here. Thanks to Carrie on the NNASJ mail list for pointing out this survey. Mike Cassidy’s column in the Mercury today announced the passing of Jonne Aleeson, proprietor of Calvin’s World Famous South Philly Cheesesteaks on the Alameda. He apparently died of a heart attack and was found in his home this past Sunday. Aleeson’s son Calvin Simmons indicated that plans to open a new store on San Carlos Street and reopen the store on The Alameda damaged by fire will go forward. A few more details are available in the Mercury story. Jonne Aleeson’s friendly smile and banter will be sadly missed by his customers. San Jose Metblogs previously reported on the fire at the The Alameda store, and reviewed the restaurant. I’m just back from this free festival, still ongoing at Backesto Park (on N. 13th Street at Jackson). 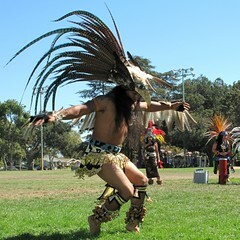 Aside from watching the artists at work, the entertainment highlight was a presentation by an Aztec dance troupe. 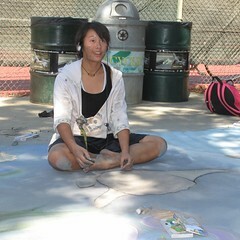 The chalk artworks should still be available to see for the remainder of the weekend. Tonight is my last dinner on the $4.50-a-day challenge. I’m not quite using up those black beans I cooked Monday night on a heavily-modified version of the enfrijoladas from Marge Poore’s 1000 Mexican Recipes. Instead of making a smooth bean sauce, frying the tortillas, and dipping them just before serving, I leave the sauce chunky, cut the tortillas into wedges, mix everything up, and bake it like a pan of enchiladas. If I had Mexican ancestors, they’re probably roll over in their grave from this butchery of the recipe. But its sure tasty. Overall, the challenge for me was more about having to cook at home every night and not eating out, than about getting enough nutrition or feeling hungry all day. Since my home cooking is even normally 90% vegetarian, the budget hardly limited my choices compared to what I’d normally cook. But all that home cooking sure did produce a pile of dirty dishes to be washed. I’m don’t think I’m going to keep this up as a normal lifestyle choice. If you’ve been taking the challenge, or just following it on the net, now’s the time to think about what else you can do for people who are living on this budget out of necessity rather than choice. United Way Silicon Valley and Second Harvest Food Bank may be able to give you some ideas. The Third-Annual “Take Flight for Kids” brings science, arts and do-it-yourself activities to Reid Hillview Airport Saturday, September 25. Take Flight for Kids is the biggest free hands-on science and art festival in the Bay Area. More than 200 nonprofit groups and vendors will demonstrate hands-on activities focused around science, technology, engineering and math. Also, live entertainment and food vendors. Take Flight for Kids is dedicated to empowering and encouraging underserved young people through hands-on science and aviation-related activities, but all young people and their families are welcome. Festival admission is free for everybody who signs up online here. Please bring a canned good, diapers and wipes, or new socks for Bill Wilson Center. The $4.50-a-day challenge is presented by United Way Silicon Valley to raise awareness of the limitations of the federal food stamps program, which provides only $4.50 per day in food to the average recipient. It’s now day two of the challenge, and I think I’m doing okay so far. Yesterday I ate Corn Bran cereal ($0.23) with 1/2 cup of milk ($0.16), 10 saltine crackers ($0.20) with 2 tablespoons of peanut butter ($0.14), a carrot ($0.30), about 3/4 pounds of grapes ($0.45), and pasta with tomato sauce ($0.75) for dinner. I also had a couple of Hershey’s chocolates after lunch and after dinner ($0.41). I got those grapes at the closing bell of my local farmers market in about a 5-pound bag for 3 bucks — not only very affordable, but a lot sweeter than the Thomson seedless grapes I’ve gotten at the supermarkets this summer. I totaled all that up and realized it only makes about $2.64, so maybe I can loosen up a bit for the rest of the week. Heat 2 Tbsp oil in a saucepan on medium heat. Add the rice, and stir until coated with oil. Cook until the rice starts to brown and gives off a nutty smell. Add the broth all at once. Bring to a boil, then reduce the heat, cover, and cook 18 to 20 minutes, until the broth is absorbed. Turn off the heat and let the rice stand 10 minutes. While the rice is cooking, heat 2 tsp oil in another large saucepan. Cook the onion until it starts to brown, about 3 minutes. Add garlic, chile, cumin, and oregano. Cook another 2 minutes. Add beans and 1/2 cup of the broth they cooked in. When the rice is finished, add it to the bean mixture and stir gently to mix. Add the salt. Cook about 5 minutes to heat through. If the mixture is dry, add a bit more of the bean broth. I may add a sprinkle of crumbled dry “enchilada” cheese to make it a little more filling. I plan to get two dinners and two lunches out of this recipe. late addition: I just found out the Twitter hashtag for the challenge is #eaton450. Let us know how you’re doing on $4.50 a day.